Please note the following Rules and Regulations for your Event WEIGH-INS. The official weigh-ins may take place on two separate days or one. The day before the event and or the day of the event. If weigh-ins are scheduled for 2 separate days, one fighter cannot weigh-in on the first day and his/her opponent weigh-in on the following day. BOTH must weigh-in on the SAME DAY! Weigh-in time windows are to be no more then 2 hours in length. Fighters who miss this weigh-in "Time Window" will be scratched from the event unless a valid explanation/reason is given to your ISCF Event Representative as to why they cannot make the weigh-in window. 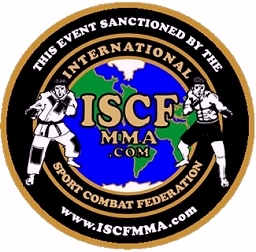 The weigh-ins must be conducted by the ISCF Event Representative ONLY at a place and time agreed upon by the ISCF Event Representative & the Event Promoter. Prior to the event weigh-in, the scales weight must be confirmed by the ISCF Event Representative with the placement of a 10 lb fixed weight (Provided by the event Promoter) to assure its accuracy. Fighter must weigh-in at the weight agreed upon in matchmaking. There is NO 1-2 lb. allowance unless agreed upon prior to the weigh-in date by the event matchmaker and BOTH fighters and trainers. Promoter/Matchmaker must inform the ISCF Event representative so that he/she is prepared that such an allowance will be allowed. Fighters in all title bouts must weigh-in within the noted weight limits of the title. There is ABSOLUTELY NO WEIGHT ALLOWANCE for Title Bouts. Whether in the agreed upon weightclass or in a "Catch weight" bout the fighters must be within the allowed spread as noted below on the ISCF weight chart. If a fighter needs to lose weight to make his/her weight, the most they can lose in a 2 hour period is "2 LBS." This is when say a Lightweight fighter at 150 lbs and a Welterweight at 160 lbs fight. What you need to look at in this case is the most narrow weight spread, which is always in the lower weight class of the two. For Lightweight, the weight spread is 10 lbs where is as in the Welterweight class, it goes to a 15 lb spread. A fight can only happen inside the limits of the weightclass of the lightest fighter. So for this example, (Lightweight at 150 lbs and a Welterweight at 160 ) this would be OK as a catch weight. However if the Lightweight fighter was 149 and the Welterweight at 160, that's 11 lbs, and it would NOT be allowed. The same if it were a pound the other way, where the Welterweight would weigh 161, again, out of the limits of the lower spread so no fight. For those looking to convert lbs to kg. If you have a 65 kg fighter and want to know how many lbs. that is, multiply it by 2.2. So, 65 kg X 2.2 = 143 lbs. If you have a 145 lb fighter and want to know the weight in kg, divide it by 2.2. So 145 / 2.2 = 65.90 kg.